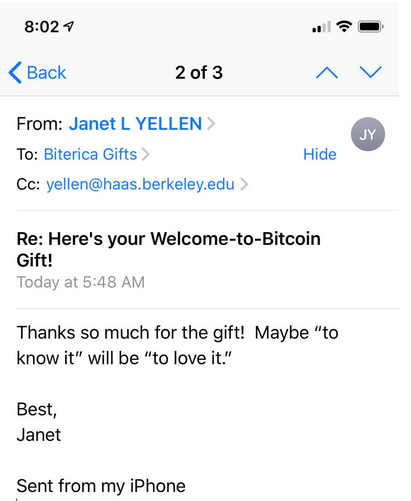 According to a recent post on Reddit, former chair of the US Federal Reserve Janet Yellen has responded to being gifted a small amount of Bitcoin. Yellen has been a vocal detractor of Bitcoin for many years. Despite this, she was quite pleasant in her response to the gift. Who knows if Yellen is legitimately interested in Bitcoin or if she secretly already had some, but concerning her recent remarks it is nice to see such a polite response. The redditor also posted a link to the wallet on blockchain.com to prove the money was sent as proclaimed. It will be interesting to see if the Bitcoin moves at any point in the future, and where. Is Yellen secretly already a HODLer?